What kind of truck scale do I really need? What are the local requirements and environment that must be addressed for the application? Which scale options would be most beneficial for the application in question? Which type of construction would be best for the environment the truck scale will be used in? Should the truck scale be installed in a pit that is flush mount with the road or include ramps and be installed above ground? Which technological advancements will pose the best advantage for my application? Things like hydraulic or digital load cells for example. All of these questions must be taken into serious consideration to get the most out of truck scale longevity, maintain truck scale functionality, decrease downtime, and maximize the return on your investment. Below is a portion of the truck scale purchasing decision guide by Cardinal Scale Manufacturing. This document will analyze strengths and limitations of options available on the market today, and which weighing technologies are the most appropriate in a given environment. A concrete deck truck scale is ideal for environments where high levels of moisture and a corrosive environment are a concern. Scrap yards, trash dumps, transfer stations, chemical distribution centers, and grain elevators are ideal environments for concrete decks due to their likelihood of causing rust. Climates where road salt is frequently used may influence the purchase of a concrete deck to combat the corrosive effects of the salt. Concrete decks yield a more reliable surface texture when in used slippery or snowy conditions. Concrete decks also distribute weight better, which gives them an advantage in applications that are of very high traffic. On average, they will require less maintenance over the life of the truck scale, and they will last longer than a steel deck truck scale. 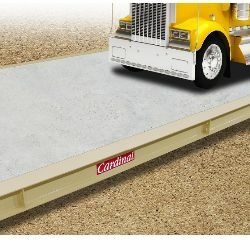 Not without drawbacks, concrete deck truck scales are more expensive, require an initial curing period, and require some additional finishing work that a steel deck scale would not. Their mass is usually greater than that of a steel deck, which will make relocation of the deck more arduous if performed at a later date. Steel deck truck scales will cost less than concrete deck truck scales, eliminating the costs of labor associated with concrete pouring. Steel decks are much easier to install and can be functional within a day, saving much-needed time when production output is of the utmost importance. Recent improvements in steel deck design provide a more robust weighbridge and less susceptibility to corrosion caused by moisture. Steel decks that utilize close-spaced, thicker I-beams and stiffeners ameliorate deflection caused by high-stress concentrations, i.e., bowing or dimpling. Minimal spacing between I-beams allows for greater CLC (Concentrated Load Capacity), a load rating which measures maximum load capacity in a moderately small area of the scale platform. Steel decks that feature an open-bottom underside prevent moisture build-up, thus alleviating one cause of deck corrosion. Despite these improvements, steel decks still have more issues with moisture in comparison to concrete decks. They tend to be more slippery in wet environments and are more disposed to corrosion. Because of their inclination to corrode, steel deck truck scales require more maintenance and tend to have a shorter service lifespan if not properly monitored and cared for. 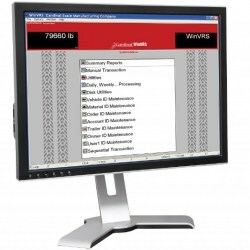 Electronic truck scales are the most common type of truck scale available on the market. This type of truck scale accumulates electrical signals, which are derived from analog strain gauge load cells and summed up in a junction box, combining signals from each individual load cell. These summed signals are then fed from the junction box into an indicator and converted into a digital value displayed for the customer to view. Analog load cells come in many variations, but the two most common types of load cells for truck scales are the compression load cell and shear beam load cell. An electronic truck scale system employing analog load cells has some distinct advantages. Analog load cells are inexpensive and have been on the market for a relatively long period. There are many variations of analog cells that are available, and they have a fairly wide range of weight capacities. Analog load cells have many drawbacks, however. Analog load cells, because of their construction and electrical characteristics, are especially sensitive to lightning damage. When a 70-foot-long piece of steel is placed in the middle of a field, like a truck scale platform used in a trash dump, it becomes a lightning rod that is very susceptible to lightning strikes. Suppression circuitry is added to the overall wiring to divert extreme lightning current from the strain gauges. However, this does not prevent load cells from being destroyed by lightning and require replacement by a trained scale service technician. Analog load cells can be prone to moisture ingress. Internal circuitry can be compromised easily, leading to unstable readings, inoperable cells, or a completely defective system overall. Hydraulic truck scale systems operate on the same information transfer system, but the elicited signal is triggered by a different source, and the respective signals are combined by stacking pressure actuators or combining pressure transducers. In the transducer method, hydraulic load cells utilize hydraulic fluid to transmit force applied to the scale weighbridge to pressure transducers, converting that force into an electrical signal. This process operates solely on hydraulic pressure, meaning no electrical components are used in the scale weighbridge. Hydraulic truck scale systems perform extremely well in moist environments, and they don’t experience many issues regarding lightning damage. Hydraulic truck scale systems do not have the onus of strain gauges or internal circuitry, allowing for superior capability in the aforementioned environment. A system based on this type of technology is more expensive than analog cells; however, this increased cost can offset the issues analog systems experience regarding lightning and water and create a lower cost of overall ownership over the lifespan of the hydraulic truck scale. Digital truck scale systems produce a digital output signal, performing the analog-to-digital conversion in the load cell itself. This important distinction precludes signal degradation associated with analog cells. Digital load cell systems are much easier to manage due to the lack of a junction box and its associated wiring requirements. Digital load cells can be simply linked to one another in a daisy chain. Digital truck scale systems, because of their simple design, are very easy to install, maintain, and repair. Since the load cells are more reliable and accurate, costs associated with diagnosis are decreased. Digital truck scale systems have the capability of detecting and diagnosing faults and failures more quickly, efficiently, and precisely. Digital load cells also offer the highest protection against lightning strikes among electronic load cells due to the transient suppression circuitry that is located directly on each individual digital load cell. Summing it all up, truck scale construction and technologies are a pretty broad range of choices. Often, the overall cost of ownership can be lowered by purchasing a higher quality hydraulic or digital truck scale that will offer more competitive features than a lower cost traditional analog truck scale. Taking these factors into consideration will improve your overall experience and satisfaction with your truck scale purchase. 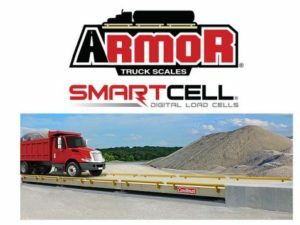 Cardinal Scale Manufacturing recently announced the official launch of the new ARMOR® series digital truck scales with SmartCell® load cells that offer unmatched performance built to last a lifetime of heavy-duty weighing use. Every facet of the digital truck scale weighbridge and electronics have been specifically built for long-lasting endurance, minimal upkeep, and IoT monitoring convenience. Deliveries are scheduled to start in January 2018. ARMOR® truck scales feature a heavyweight 50-ton CLC, no moving parts below the scale deck (including the load cells), more structural steel than the competition, SmartCell® stainless steel waterproof digital load cells, and IoT-enabled iSite remote monitoring software. The state-of-the-art, debris-inhibiting axis load cell stand design limits obstructions to the scale’s performance with the digital load cells mounted high within the stand near the scale deck. The load cell stands are fabricated from one-inch-thick steel to minimize rust and corrosion damage and ensure long-term strength and durability. The long-lasting baked-on tan powder coat paint finish ensures a lifetime of trouble-free protection. The Cloud-based iSite remote monitoring software offers e-mail and/or text alerts to ensure your scale is performing at all times. ARMOR® steel deck weighbridges utilize a tight concentration of 7.5-inch I-beam spacing which minimizes unsupported deck plate area and ensures that truck tire contact patches are always directly supported by one I-beam. Four rows of welded stiffeners provide maximum structural rigidity and safeguard against I-beam deflection under loads for optimal strength and longevity. Cardinal Scale’s SmartCell® digital load cells are the newest solution in advanced load cell technology. Messy, time-consuming wiring is no longer necessary, since cables connect plug-and-play to the cell through metal braided rodent-proof cables. Internal cell circuitry eliminates the need for a junction box. The ARMOR’s SmartCell® load cell pockets are surrounded on both sides by I-beams which run the entire length of the weighbridge. This alleviates any potential structural weakness around the load cell region like in competitors’ truck scales. The no-bolt bridge connections feature interconnecting load blocks and receivers welded directly to the I-beams for strength and durability. Contact your local Cardinal Scale dealer today to begin taking advantage of the entire gamut of new features and functions of the Cardinal ARMOR® digital truck scale! Below is a case study that Cardinal Scale Manufacturing produced recently. The well known scale manufacturer provided weighing equipment including load cells, junction box, and a digital weight indicator to a scale company in Latin America who had actually constructed their own truck scale. All they needed was high quality electronics to finish the project correctly. Let’s take a look below at a few of the highlights. The Pepsi-Cola factory in Caucagua, Venezuela has recently expanded their production line to include a variety of additional world-renowned brands, such as Gatorade, Yukery Juices, and Lipton Ice Tea. This Caucagua factory is among the three largest soda factories in Latin America. With the increase in production, PepsiCola was looking to install a new 80-ton by 10-kg capacity truck scale. After intensive bidding by local scale dealers, Cardinal Scale’s authorized dealer, Industrias Metarmes, won the bid. They turned to Cardinal Scale Manufacturing for the load cells and junction box, due to the solid reputation Cardinal Scale has built internationally. Industrias Metarmes fabricated their own truck scale weighbridges and used Cardinal Scale Manufacturing’s electronic components for the application. Industrias Metarmes utilized eight IP68-rated Cardinal Scale model DB 75,000-lb double-ended shear beam stainless steel load cells and 8-cell stainless steel junction box for the scale. To meet the needs of the Pepsi-Cola factory, the dealer utilized a Cardinal Scale 225 Navigator indicator. This indicator allowed Pepsi-Cola’s logistics operation to store 200 weight IDs, making for a more time-efficient procedure. The 225 indicator can store truck descriptions and material prompts, which makes recalling tare weights quick and simple. The 225 indicator’s RS232 serial port was connected to a printer for printing weight tickets. The alphanumeric keypad was also an important factor in the decision for the 225 indicator making it more convenient for data entry. You can read the entire truck scale case study here. We should also mention that Cardinal does manufacturer truck scales as well and they also provide accessories such as a ticket printer and large remote display with stop/go light. Cardinal Scale Manufacturing Company has been awarded a $2.7 million contract in collaboration with Xerox and the Maryland State Highway Administration (MDSHA) to provide virtual weigh stations and continued maintenance for 13 additional sites in the state of Maryland throughout the next three years. The contract includes Cardinal Scale’s Weigh-in-Motion (WIM) vehicle scale equipment, installation, software, maintenance, and on-call services. Cardinal Scale is using the company’s quartz sensor weigh-in-motion (QWIM) technology to screen trucks based on weights, dimensions, and credentials. This will allow the MDSHA to enforce commercial vehicle regulations and to collect traffic data. The data systems will provide 24-hour information from each installation point on Maryland’s highways and transmit it wirelessly within seconds. This information can be viewed from any computer via cellular connection in real time. Cardinal Scale’s virtual weigh stations capture data including a picture of the moving vehicle, individual axle and gross weights, axle spacing, vehicle classification, speed, over-height violations, out-of-balance conditions, license plate, and DOT information, as well as time and date. The system will instantly alert law enforcement of any violations by displaying a diagram of the truck’s axle weights along with other information. If you own a feedmill or you run a company that owns truck scales then you’ll want to hear about this story. Basically, there were a few folks creating fake tickets at the scale for loads of corn that were paid for but never delivered to the actual feed mill. The result was a crime in excess of $2 million. Hobbs worked as a scale operator and pellet mill operator at Cargill’s Butterfield feed mill from December 1999 until March 2013. When a delivery truck would arrive at the feed mill, Hobbs was responsible for weighing each truck and its contents. Once the truck was weighed, Hobbs created a scale ticket for the company that delivered the grain, corn, or feed. A copy of the scale ticket was sent to Cargill’s headquarters in Minneapolis, Minnesota, for processing and payment to the trucking company. Beisly and Bunn approached Hobbs in 2002 about creating fictitious scale tickets for non-delivered loads of corn as a way to make money and ultimately defraud Cargill. Hobbs began creating completely fictitious scale tickets for Beisly and Bunn for the delivery of loads of grain, corn, or feed that did not truly exist. Beisly owned and operated K&B Grain. Beisly obtained contracts with Cargill for the delivery of a set number of grain loads that were supposed to deliver grain, corn, or another type of product to the Butterfield feed mill. Beisly admitted that he received numerous fictitious scale tickets from Hobbs for deliveries that were never actually made. Beisly also admitted that at least once a week, he received a fictitious scale ticket from Hobbs that claimed he had delivered a shipment of grain to the Butterfield feed mill, when in truth and fact, no such shipment or delivery was made. Shortly after the fictitious scale tickets were created by Hobbs, Beisly received a payment from Cargill. Bunn owned and operating RB Grain. Bunn was contracted through The Scoular Company to transport shipments of wheat, corn, and grain to the Cargill feed mill in Butterfield. Bunn also admitted that he received numerous fictitious scale tickets from Hobbs for deliveries that were never actually made. Once Scoular received a payment from Cargill based on the submission of a fictitious scale ticket, Scoular issued a check to Bunn based on the delivery of wheat, corn, or feed that was never delivered. Hobbs initially received $300 in kickbacks for each “ghost load,” which was later increased to $500 in cash for each “ghost load.” Cargill officials discovered the fraud when the amount of grain, corn, or feed that was being paid for was inconsistent with the amount they actually received. Over a span of nine years, this fraud scheme caused losses to Cargill of approximately $2 million. So how do you prevent this type of behavior from happening to your business? One way is to install cameras to take photographs of a truck at various stages of a transaction is one way. The photographs or video can show whether or not a driver has positioned a truck properly. Another way is to utilize vehicle recording software such as Cardinal WinVRS or Rice Lake Transact. From installation and setup, to everyday transactions, data management has never been easier! Rice Lake TRANSACT® was designed to make new scale management installations or upgrades virtually effortless. Even operators with little or no computer experience are immediately comfortable with its intuitive, graphically enhanced user interface. But don’t let its simplicity fool you – TransAct serves as a powerful central database, seamlessly integrating your entire operation with transaction information. From the scale, to the office, to the customer, all relevant data is quickly and accurately generated for each step in your enterprise. One of the largest chicken integrators in Malaysia operates a feedmill, which is located at Port Klang, Malaysia’s premier port. The feedmill imports raw materials from Asia, Australia, Europe, the USA and South America and exports processed chicken to both the domestic and export markets in Singapore, Bangladesh, Brunei, Hong Kong and the Middle East. The feeedmill has a capacity of 160,000 metric tonnes of poultry feed per year, making it vital for the mill to have accurate measurements of incoming raw materials and outgoing finished product. When the feedmill opened in 1990, Avery Weigh-Tronix installed a 12 metre weighbridge with a capacity of 40,000kg. After more than twenty years of successful operation, incoming and outgoing trucks got longer and heavier as the plant’s capacity increased. As a result, longer trucks had to be unhooked from their prime movers in order to fit on the weighbridge platform. As well as the inconvenience caused, this also resulted in weighing accuracy problems. The longevity and reliability of the older weighbridge lead the customer to contact Avery Weigh-Tronix to help resolve the problem. After careful examination of site requirements, the team from Avery Weigh-Tronix recommended that the company replace the older scale with a new 18 metre BMC weighbridge. The existing compression load cells, indicator and computer were retained, keeping costs down by re-using existing parts and reducing the need for additional training for weighbridge operators. Four new load cells were added, increasing the capacity of the weighbridge to 80,000kg. After a site survey, the team advised the mill to move the weighbridge to a new location, making better use of the tight space available on site as well as offering smoother traffic slow and improved site security. Click here to read the rest of the case study. Companies all across the United States are looking and searching for ways to make their business more efficient and profitable. And it doesn’t hurt to make the the employee’s job a little easier while collecting more data relating to your business. In the article below, a rock quarry does just that with the help of Cardinal Win-VRS computer software. White River Materials has seen their business grow by over 530% since 2002 with truck weighing transactions currently occurring every five minutes on average all day long. This busy shale rock quarry is a division of Atlas Asphalt, Inc. and they have been servicing central and northeast Arkansas with driveway and road base materials, concrete aggregate, and asphalt aggregate since 1968, providing materials for general contractors, homebuilders, municipalities, and other commercial clients. Their specific location in Cord, AR was selected due to the abundance of shale in the area along with its close proximity to a new highway expansion project which made the site convenient for transporting material to many different locations. White River Materials initially had a system in place for their truck scale operation that only allowed 200 ID’s for trucks, and they had to write all the IDs down on a legal pad along with the tare weights and associated company. Once the customer’s truck was on the scale, the scale operator had to dig through sheets of paper, key the appropriate numbers into the indicator, hand write the job ticket on 3-part forms, subtract the gross and tare weights by calculator, add up the daily net tons of every job material for each respective driver as well as cumulative net tons for job material, and then have the driver sign the ticket.